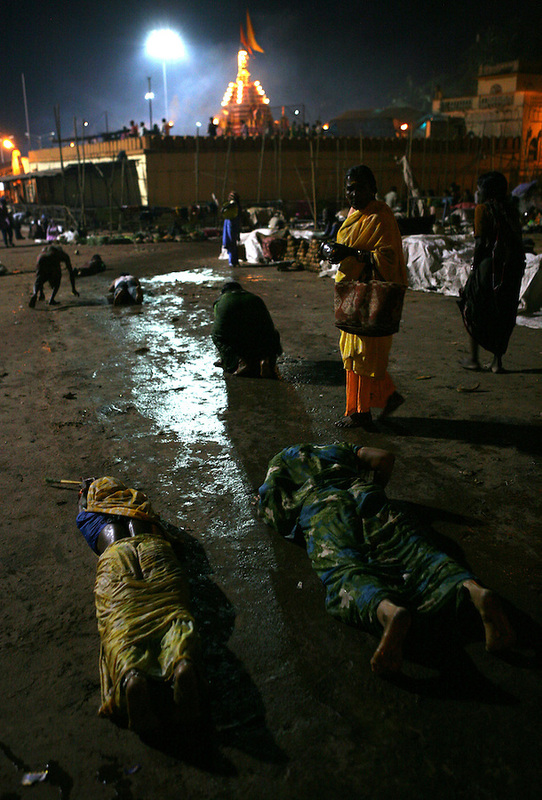 Yellamma worshippers throws themslves on the ground as a sign of their devotion to the goddess Yellamma after bathing at the Yellamma temple during the Yellamma Jatre (fesival) in Saundatti, India. In addition to this gesture of worship, young girls from impoverished families are "married" to the goddess Yellamma during the full moon festival to appease the goddess. Once they are married to Yellamma, they are regarded as servants to the goddess and must perfrom temple duties as well as satisfy the sexual needs of the priests and other men. They may no longer marry a mortal and often end up being sold by unscrupulous priests to pimps who take them to work in the red-light districts of India's urban areas.